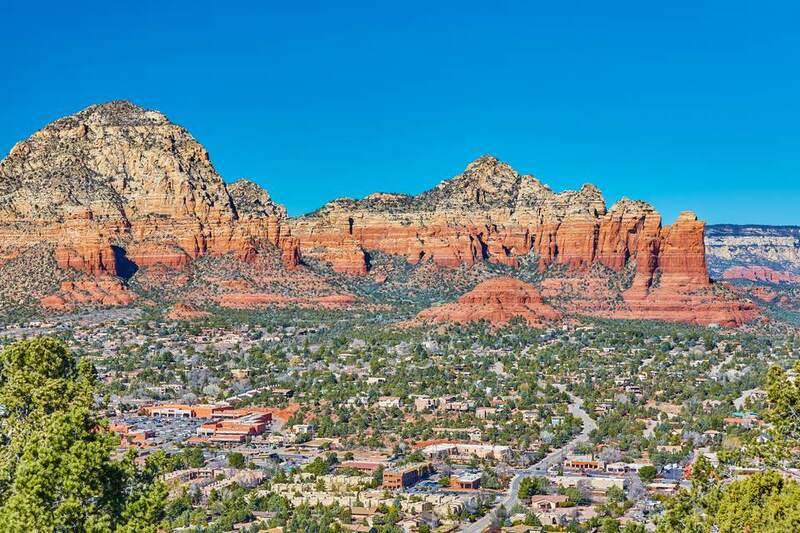 Sedona is worthy of budget travel consideration for two reasons: its scenic splendor, and its strategic location about midway between the Grand Canyon and Phoenix. Sedona is situated in what is called "Red Rock Country," and it doesn't take a geologist to explain that label. For miles around, magnificent rock formations jut from the landscape. This high desert plateau also features Oak Creek Canyon. Tourists pass through not just because of the local scenery, but also because the area is close to a major interstate junction in Flagstaff (26 miles north of Sedona) and a neighbor of the ​​Grand Canyon (the south rim entrance is 110 miles north). There are art galleries, tour operations, shopping centers, and restaurants to fit every budget. But the greatest attraction here is found in nature. Take a look at what Sedona has to offer and how you can afford a visit to this beautiful area. Oak Creek Canyon isn't as well known as another certain canyon to its north, but don't let that stop you from setting aside a half-day to explore here. Much of Arizona Route 89A between Flagstaff and Sedona runs along the canyon floor. There are pull-offs and parks for your exploratory and photographic pleasure. Best of all, there is no toll for all of this beauty. It ranks with other free scenic drives that can add value to your vacation. A few words of caution: it can be a dangerous route in bad weather or for those who tend to drive too fast. At the northern end of the route, you'll snake around hairpin turns and climb to about 6,400 ft. above sea level. A parking area there affords great views of the canyon. Take a break from your scenic drive for a hike around the base of Midgley Bridge, your gateway to the town of Sedona. Just more than one mile north of the Sedona central business district on Highway 89A, you'll come to Midgley Bridge. On the north side, there is a parking lot that often is filled to capacity—or with creative parking, perhaps beyond capacity at times. But it's well worth the effort to find a parking spot here and explore the views of the structure and Wilson Creek below. If you're a hiker, note that no less than four trailheads converge in this parking area. They range from fairly easy to strenuous, but they also provide places to enjoy the beauty of this area without slipping down a hillside. All the same, keep small children close at hand in this locale. If you choose to make the round trip on 89A to Oak Creek Vista and back (16 miles north of Sedona and back) and the parking lot is full on your outward journey, sometimes it's better to save this stopover for your return trip. There are plenty of restaurants in Sedona that offer great views and high-priced food. Skip them, pack a picnic lunch and head out of town. Sedona is a town that depends upon tourism as a major source of revenue. You'll see the t-shirt stores and souvenir shops that you've come to expect in such places. But Sedona also mixes in some nice art galleries and open-air restaurants. Just be careful about prices. Those restaurants that serve up brilliant dining vistas might not fit your budget. As you move to the southwest on Highway 89A beyond the intersection with U.S. 179, you enter the Sedona in which permanent residents do business. Here you can purchase reasonably priced meals or stop at a supermarket and assemble a picnic lunch. It's likely there are few places on your trip itinerary that afford better picnic opportunities than the Sedona and Coconino National Forests. Sedona offers hiking trails for all levels of fitness. Just be certain you don't forget to pack a supply of water and some sunscreen. When you exit Interstate 17 and proceed northward on U.S. 179, you'll come across the U.S. Forest Service's information station. It's a great place to stop and plan your day. Consider at least one hike during your stay—even if it's a short, easy one. The advice you get at the information station will prevent you from attempting hikes that are beyond your ability, and probably save time wasted by wrong turns. There are hikes here for all levels of ability. If you'll be parking in the trail head parking lots, you must display a "recreation pass," which can be purchased at the station or a few other locations for $5. On certain days (including the day of my visit), the fee is waived to promote outdoor activities. Note that if you already possess a U.S. National Park pass or a Golden Age Access Pass, you need not purchase a recreation pass. Wherever you choose to hike, be assured you'll enjoy some wonderful scenery. Be sure you set out fully prepared with drinking water and sunscreen. Doe Mountain is actually a mesa. Once at the top, you can walk around a flat surface for your choice of breathtaking views. When you enter the trailhead parking lot and look up, you might doubt whether or not you'll make it to the top. The trail is less than a mile in length, but it climbs about 400 vertical feet. In places, the trail is obvious, while in others you'll be picking your way around boulders. It features a series of switchbacks and points to stop and rest. These are also great vantage points for close-up pictures of the surrounding sandstone cliffs. At the top, the reward for your exertion is a sweeping and spectacular view of the entire valley and the town of Sedona in the distance. At the Sedona Airport parking lot, you'll find plenty of traffic just before sunset. The visitors are not here to catch a flight, but rather a sunset. From Highway 89A turn to the south to reach Sedona Airport. Once that turn is made, you'll start climbing. The airport (used mostly as a base for sightseeing flights) sits on a mesa that overlooks the town and the red wall of cliffs that serves as Sedona's backdrop. As evening descends on the area, these red rocks are bathed in the glow of impending sunset—it's a sight not to be missed. Adjacent to the airport parking lot is a fenced viewing area where the scene can be safely observed. Word has spread about this free attraction, and many days you might not have your first choice of places to park or stand because of the crowds. A gentleman who serves as the airport's "ambassador" helps direct parking lot traffic (which can be quite a job in the late afternoons) and will answer your questions if he can. Parking and hospitality are free here, but there is a box where you can leave a dollar or two as a tip. On a busy night, you could see 300 or more people here. As the sun sets on your visit to Sedona, you will find yourself thinking about another trip to this beautiful setting. Sedona isn't known as a budget travel mecca. In fact, it tends to be rather upscale. Finding luxury hotel rooms here isn't all that difficult. But you can also find affordable rooms with some effort. A room search for Sedona reveals nightly rates that are well in excess of $150/night. The most reasonable rates can be found to the north in Flagstaff, about 26 miles to the north. Camping in Coconino National Forest is an affordable alternative, with rates in the $18-$25/night range. Be aware that campgrounds might be closed during the winter season. Some of the sites are reservable, but many are offered "first-come, first-served," so make your arrangements on arrival and then go sightseeing. Manzanita campground is open all year and offers an $8 permit for picnic/day-use. Most people drive to Sedona, but if you'll be flying into the region, Phoenix (121 mi.) offers a selection of budget airlines that includes Alaska Air, Frontier and Southwest; Alaska Air also serves nearby Flagstaff.